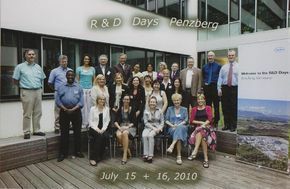 On 15th and 16th of July in Munich a International meeting of Laboratory doctors and specialists form England, Switzerland, Germany and Bulgaria was held. Organizer of that meeting was Roche – the leading lab equipment and reactors for clinical and other labs producer. Doctor Hristina Pakerova took participation on behalf of Hill clinic, a lab specialist in the clinic. Lecturers were university lecturers form Munich and leading specialists in the science department of Roche. For the first time the participants were admitted to the producers activities in the head office of the company in Pensburg where they saw the Roche precision regarding quality. Some of the main topics were modern diagnostics and follow up of socially significant illnesses and risk groups by the use of bio-markers of the last development of the world producer. Especially interesting were topics regarding present diagnostics and tumor markers interpretation, genetic examinations, markers for early diagnosis of preeclampsia, myocardial infarction, neurological disorders. The Lab in Hill Clinic is working with equipment of the world company and uses highest quality reactors including tumor markers.